Wow twenty-two weeks at Sharon’s Independence Days already. It’s been fun and eye opening to track all these little baby steps each week and see how they are adding up. We had the first frost of the year last week and therefore had a mass exodus of produce from the garden. 5 gallon size bags filled with tomatoes went into the freezer and lots of winter squash went down to the basement for storage. There is a lot of damaged squash that we’ll be cooking up this coming week, turning it into puree for soups and bread recipes. Also, after the awesome compost class that Rick and I took in September, we’ve been working on the big compost remodel… first moving the chicken coop, then deciding on a plan for the space then collecting materials. Rick was able to dig up some pallets from his work, so the biggest part of the bins will have cost us nothing. Yay! Harvest Something – all the acorn squash & butternut squash, the pumpkins, all the tomatoes & zucchini. Eggs. Also Rick & H got a dusky (blue) grouse, and Rick brought home a mallard drake as well. Preserve Something – Potatoes and winter squash to basement, froze tomatoes, froze the duck and a second grouse that Rick’s uncle gave us, made a double batch of curried carrot-leek soup for the freezer. Waste Not – Lots of “new” clothes for me from my sistah. 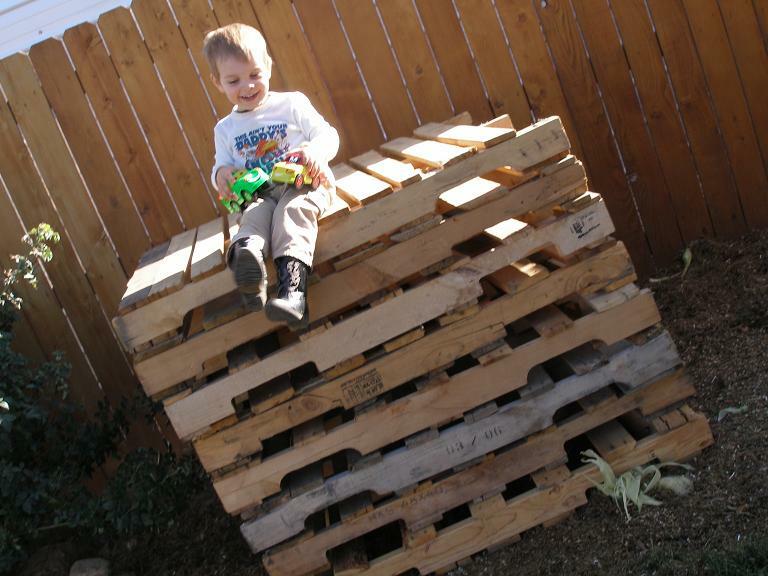 Rick brought home some pallets from work to use to build our new compost bins. Also traded a large propane tank for a smaller one that will fit our gas grill. Want Not/Prep & Storage – besides items added to freezer, nothing to add to this category. Build Community Food Systems – posted on craigslist for the Englewood Farmer’s Market. Ordered the hog that we’re splitting with friends. Checked out another market in Littleton, will be going back to get apples this coming week… refrained from buying honeycrisp apples brought in from Washington at Costco for only $0.50/lb, even though the Colorado ones are $2.20/lb at the farmer’s market. Place duck and marinade into a ziplock bag in refrigerator and marinade for 2-4 hours. Heat charcoal grill. Place duck breasts on grill when flame has died and coals are hot. Cook for 2-1/2 to 3 minutes on each side until rare or medium rare. Let rest 1 minute. Serve. *note that duck is a red meat (not like chicken), and can safely (and deliciously) be eaten rare. please link me to the farmer’s market link on craigs, i’m searching but cannot find. i wish i would have know you wanted apples whilst i was on the western slope. how many honey crisp do you need? we have also put our tomatoes in the freezer from the freeze – argh – the garden dies a slow death. now we have to find a recipe for FROZEN ‘GREEN’ tomatoes – ha!